Octonauts Toys - Octonaut Games, Vehicles & Figures from Fisher Price! The Octonauts is one of CBeebies' favourite children's shows, and demand for official merchandise was among the greatest we've ever seen. Fisher Price were given the job of producing a wide range of Octonauts toys - and they most definitely didn't disappoint little Octonauts fans. First released in July 2011, the first wave of toys were quickly snapped up by an eager bunch of consumers who were ecstatic at finally being able to purchase playsets, vehicles and figurines of all their favourite Octonauts characters. At Toy Shop UK we particularly love the The Octopod Playset, the showcase toy in the range. 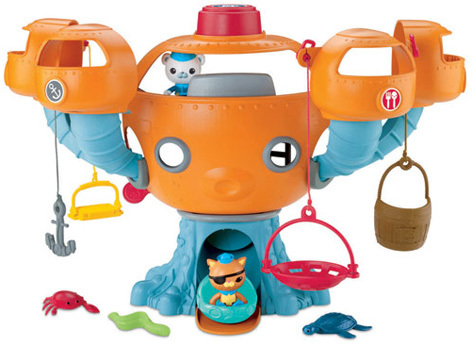 This particular playset (featuring Captain Barnacles and Kwazii Kitten figures) gives preschool children the perfect opportunity to help their heroes explore the undersea world and rescue sea creatures in distress. Other popular selling toys include Kwazii’s Shipwreck playset, GUP-D Sub, GUP-A Mission Vehicle and GUP-X Shoot and Rescue Vehicle. Ravensburger won the rights to create a series of Octonauts jigsaw puzzles that included a huge floor puzzle as well as smaller boxed jigsaws featuring popular scenes from the show. Kids that love to have their favourite characters plastered all over their bedroom will also be pleased to know that they can get hold of Octonauts bedding and accessories from Zap. In October 2013 it was announced that Fisher Price had extended their licence with Silvergate Media, the creators of the show. Broadcasting in over 100 countries worldwide, Octonauts toys are popular purchases by parents who value the curiosity and imagination that each episode creates in their youngster’s minds.